Found 3 file extension associations related to NewsBin and 3 file formats developed specifically for use with NewsBin. 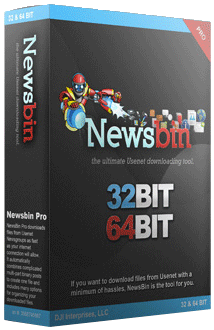 NewsBin is a news robot application that automatically downloads and decodes binary posts from Usenet newsgroups. If you need more information please contact the developers of NewsBin (DJI Interprises, LLC), or check out their product website.